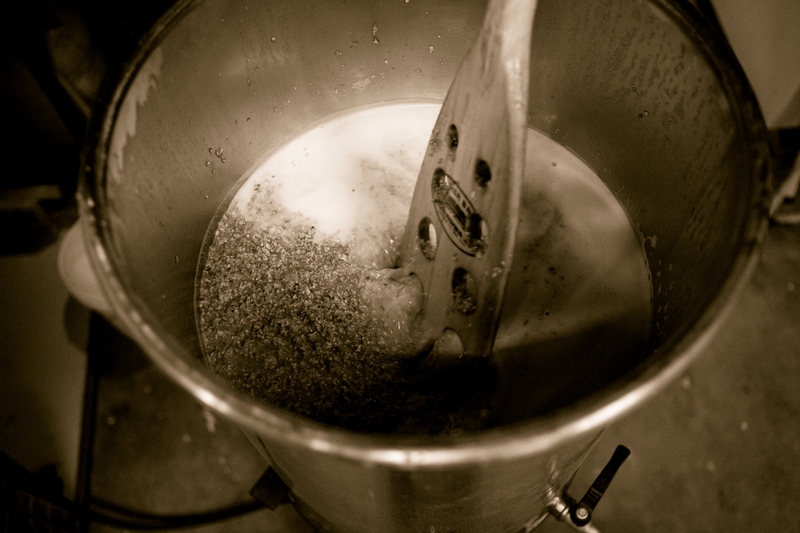 Homebrewer: Shawn Olsson Part 2. When Brian and I pulled up to Shawn Olsson’s home and brewery in Fullerton, Calif. we were cheerfully greeted by 2-year-old Clare Olsson, who was ever so eager to show us her sand box and bubble machine in the backyard. Not too far behind Clare was her little sister Olivia. Shawn, 44, who had always desired to have children, finally became a father after a year into his second marriage to wife Sonia. Their nice one-story home is not only a safe haven for their beautiful family, but it is also residence to Shawn’s garage brewery and wine cellar. His setup is compactible for more efficient storage to allow room for strollers and family needs as well as Shawn’s other hobby – restoring Vespas. Just abut Shawn’s brewing equipment, sat a teal Vespa in several pieces. 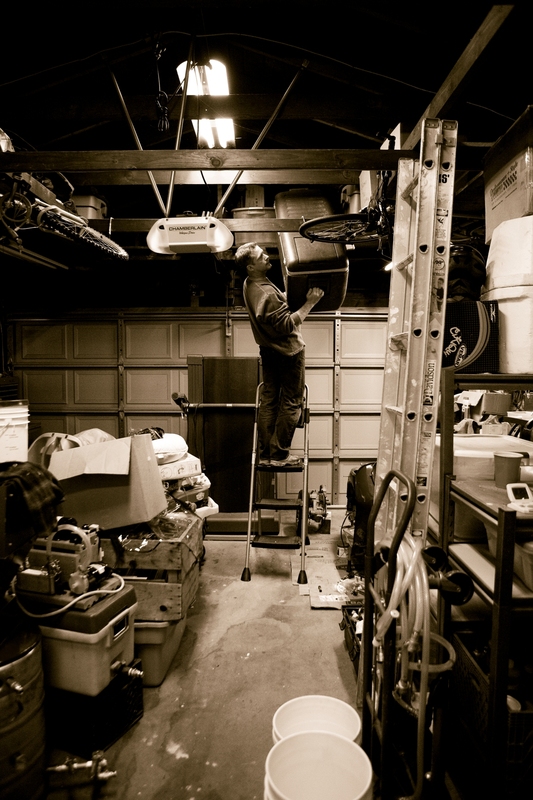 Shawn promised himself he would take a small break from brewing for a weekend or two in order to work on the scooter. Though it is safe to say his beer supply wouldn’t dwindle too much during his brewing break as it seems he has aplenty to go around. Shawn currently has four beers on tap: Oak Glenn 2010 Hard Cider (which he recently brought to the Addison Homebrew Provisions meeting for tasting), Lawn Genome IPA a La Chouffe, Q! (a Belgium quad with a plum and dark chocolate scent and smooth finish), and Wit Wedding 4.0 (commemorating four years of marriage to his beautiful wife Sonia – Shawn originally brewed this witbier for their wedding). 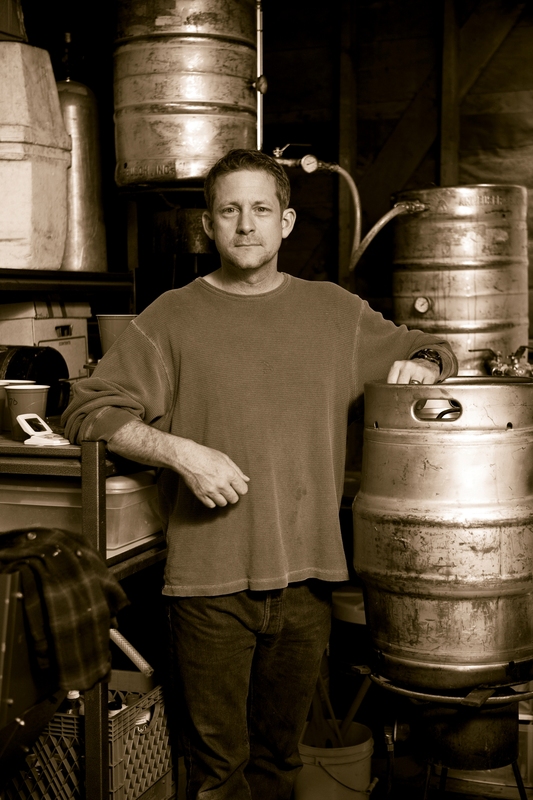 Shawn was originally introduced to homebrew by his stepdad, who mostly brewed batches from canned kits. “It was pretty good stuff,” Shawn said. Realizing homebrew had piqued Shawn’s interest his mom bought him a kit for Christmas one year. And so the brewing began. Shawn, a highly intelligent individual, continuously utilizes his intellect and thirst for knowledge to better his brewing. In the early batches of Shawn’s brewing experience, however, he was unaware of sanitation requirements and he let pride get in the way of a bad batch. “I made really infected beer, but I was too stubborn so I drank it,” Shawn said. He went on to explain that abnormal blotches began appearing on his arms, but he continued to drink the infected beer. Finally when he stopped drinking the bad beer the blotches disappeared. The lesson was learned and Shawn made sure to pay attention to simple sanitation rules from then on. 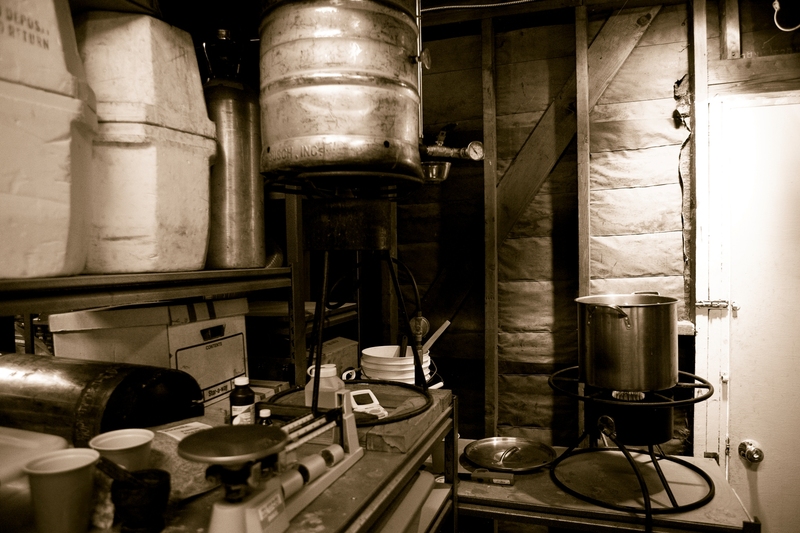 About a year into homebrewing Shawn delved into the hobby and began brewing once a month, which went on for three years. Exploring even further, Shawn took an extension course at UCSD and learned all grain. 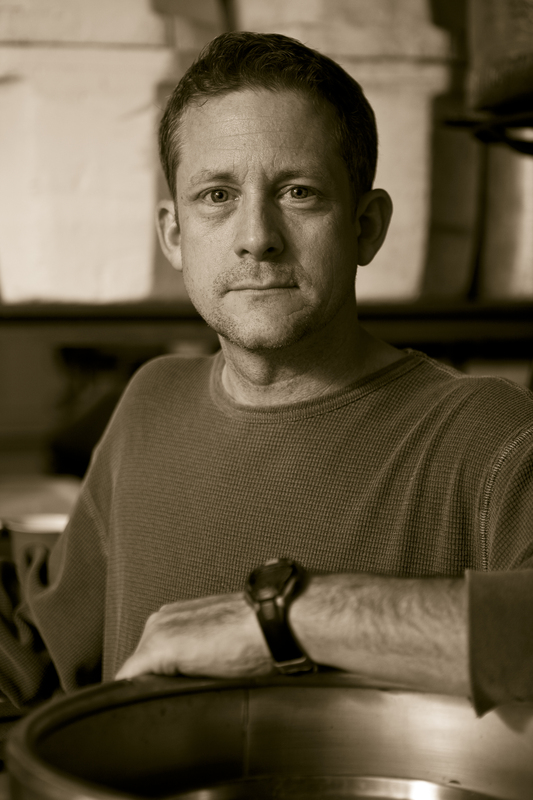 He began reading books on brewing and even joined Crown of the Valley Brewing Society, established in 1988 out of Pasadena, Calif. Two years in, Shawn became the vice president and eventually led the group as president for seven years. “It was a tight little group of people,” Shawn said. Over the course of time together they all learned to better their beer as they learned from one another. Eventually though, Shawn decided it was time to let the next generation take over. Furthermore when Shawn went through his divorce, he walked away from the club and brewing altogether. Three years ago, Shawn really got back into brewing. Though things in his life had changed his youthful spirit and eagerness to learn to continually better his beer is ever present. He swears by the book Brew like a Monk. “It kind of inspired me,” he said about the book. Shawn is very enthusiastic about the science behind the beer, because he knows if he can understand the scientific concept behind any part of the brewing process, he is able to apply it to get the results he wants. That is not to say he doesn’t believe there is a creative side to the process as well. Interestingly, Shawn is also a fabulous cook according to his wife. As the conversation arose, he passionately described a five-hour, six course Italian meal he made on one occasion. Here he is talking about the science behind beer and using chemistry to understand the process, and on the flip side he talks about his inspirations and his passion for brewing and cooking. This truly demonstrates what a multi-faceted person Shawn really is. Unsurprisingly food and beer correlate. Unsurprisingly again, Shawn has a taste for both. In fact, he took the Beer Judge Certification Program (BJCP) test. Studying for the test helped Shawn open his palette. The test required Shawn to answer essay questions that resulted in 15 handwritten pages and to sample and critique in detail numerous beers. Becoming a certified beer judge has not only made Shawn into a beer expert, but it has also made him into a foodie. 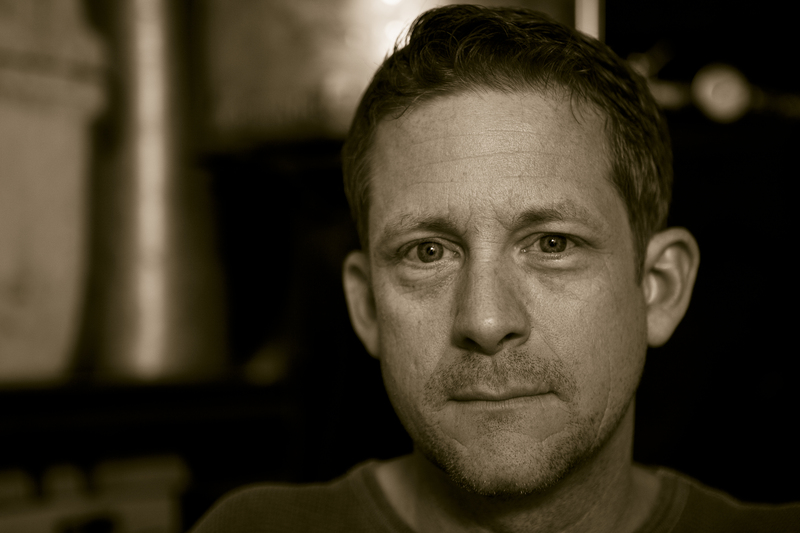 Shawn uses his vast knowledge to teach others as he often speaks at the Addison Homebrew Provisions meetings. Shawn also leads beer demonstrations for fellow homebrewers, though he continuously refers back to his favorite book, Brew like a Monk. According to Shawn the book expresses the importance of being creative and the writers are quite coy in how they brew. Shawn agrees with their methods. Shawn strives to brew to a standard he has set for himself. He is very critical of commercial beers and prides himself in trying to outdo them. When he succeeds it is pure bliss for Shawn. He compared himself to his daughter Clare. When she was learning to climb up steps, she was so proud when she was successful. ‘I did it!’ she would exclaim. Shawn expressed that he feels the same when he brews something great. His beer style is very traditional and European, though it certainly does not lack creativity. “That’s the sandbox I like to play in,” said Shawn. The Dubble I brewed is a blend of the Chimay Red and Rochefort 6 dubbles. It uses the Rochefort malt bill, the Rochefort hops, but Chimay yeast and has about as much sugar added as Chimay does. The bitterness level (IBU) matches up to both Chimay Red and Rochefort 6 which are nearly identical (18-19 IBU). The resulting beer is much maltier than Chimay, but not as dark and malty as Rochefort 6. The beer is big and malty with plenty of fruit flavors, but the finish is relatively dry so it doesn’t just lay on your pallet…sort of compels you to take another sip. The hops just barely come through in the end almost the way spices do when you do them right. I think I’ve really blended all of the flavors from my favorite Belgian dubbles in this beer. After reading Brew Like a Monk I had a much deeper understanding of how to brew Trappist Style beers. Most of the lessons learned can be seen in this beer compared to my earlier attempts to brew a dubble. My Chimorte Dubbl8tion had an OG of 1.074, FG of 1.013 and ABV of 7.7. Until next time enjoy a few extras from the original shoot .